In May 2017 I celebrated my 10 year anniversary of working remotely! When I first started working from home, people typically called that type of work arrangement "virtual" or "work at home" (WAH). In 2013 Jason Fried published the book Remote, which really popularized that term ("remote") and brought it to the forefront of communication among companies where people work from home (or are "distributed"). 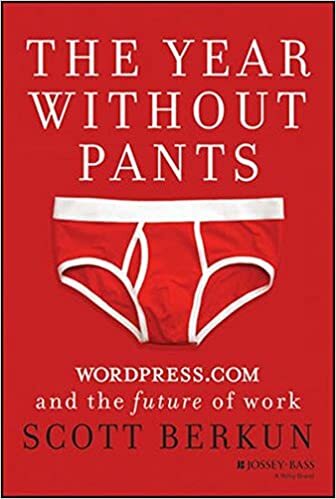 As a remote worker, I am often very interested in other distributed companies and how they do things, so when I heard about The Year Without Pants, a book about how Automattic runs an entire company with 120 employees completely distributed all over the world, it piqued my interest. My book club selected this book for the month of June and I thought it might be fun to share some of the discussion we had (as a group of remote workers) about the book. We met recently and I asked some questions to get the conversation going. We had a great discussion! What do you think was the purpose of this book? Was there a specific passage or quote that left an impression on you? After reading this book, what did it make you want to learn more about? What did the book leave unanswered for you? How Automattic handles things like finance and paperwork. Everyone seemed to have really enjoyed the book. One person specifically said she liked the "storytelling" aspect of it. The author, Scott Berkun, provides insight into remote work (good and bad) through his own personal experiences working at Automattic for about a year. We all did joke, though, that Berkun sure did seem to travel to a lot of work retreats in that time period! Personally, I thought The Year Without Pants was cute. If you're interested in, or curious about, remote work and/or want to learn more about Automattic (or Wordpress), I recommend it!